Deutsch LA's campaign for DirecTV is hardly new—on the other hand, it never gets old because it's so well executed. This new commercial in the series features Kathy Bates and James Caan in 1990's "Misery." This guy's no Jared, but since his thinking is so in line with the current Wendy's marketing philosophy, maybe he should be the chain's new spokesperson. If you want to get nice and depressed about the state of trade publishing, look no further than Reed Elsevier's announcement yesterday that it was getting out of the business, looking to sell magazines including entertainment industry bible Variety, Broadcasting and Cable, Multichannel News and Publishers Weekly. The company's CEO says it's looking at "reducing exposure to advertising markets and cyclicality." It's not exactly news that advertising is cyclical. What he doesn't seem willing to say is that print trade publishing is on a downward trend it may never get out of. Came across this celebrity-free commercial from Nationwide still using the "Life Comes at You Fast" theme. It lacks the buzz value of using K-Fed—or even Fabio—to make the tag come to life, but still comes through on delivering an almost palpable punchline. Plus, I bet it cost a lot less since it doesn't use any of those famous-for-being-famous types. Via Funnyplace.org. Unclear as to what the connections are between cavemen, basketball and car insurance, but Geico gets something I don't. Just noticed it's trying to build the biggest hoops bracket ever via a Facebook app, with a caveman guru as a guide. The links between all of these may indeed be tenuous, but Geico is thought of as a friendly enough brand these days that this'll probably do really well. 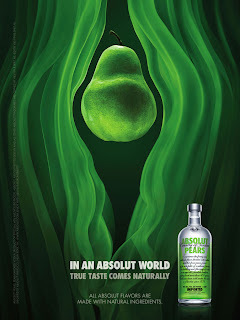 OK, Mediapost says this Absolut ad is supposed to equate vodka taste to natural childbirth. I'm not on quite the same wave length. To me—and not to be gross, but honesty is the best blogging policy—it looks like one of those animations of a tampon ad trying to prove that the product doesn't allow for leaks. Only the product is upside down, and it's green. There. I've said it. Via TBWA/Chiat/Day. So checking out these Webisodes for the Tassimo customized hot beverage thing. (A short clip from one is posted above.) They feature a guy named Bob, who is more or less the office loser, and they're pretty funny, if a bit long. The payoff is a $20 mail-in rebate on a Tassimo beverage system. As part of the loser theme (though of course the site doesn't use the "L" word), people are asked to submit stories of their own office "Bob." The best so far: "My Bob thinks everyone is out to steal his desk chair: Of course, this has now become a self-fulfilling prophecy prank. We all take turns moving his chair to other people's offices when he's not around." Why do I feel like I've done that before? Created by Ogilvy Entertainment with writing from this Jim Biederman. I'm enough of a curmudgeon that headlines like the one above, make me whisper under my breath, "I told you so." The headline from Ad Age sits on top of a story which says that 87 percent of client-side respondents to a survey conducted by the Association of National Advertisers and Forrester Research say they're going to spend more money on Web ads this year. There are a lot of other stats in the story, but here's another one that stands out: 62 percent of those surveyed think that TV ads are not as effective as they were two years ago. When the upfront is up again in a few months, let's revisit this story. Or maybe it won't be. Now that my first Mediapost column is up—and some of you that have read that are stopping off here—thought I'd announce that I'm the new (and first) Social Media Insider for Mediapost. I'll be posting more or less weekly, and think it'll be a blast to cover. As for you newcomers to Adverganza, keep reading it too, if you like what you see. It's about the broader world of advertising, including good, old-fashioned 30-second commercials. Ideas are always welcome wherever you see me write about anything to do with advertising. Thanks all. Esurance ads put the E in "Eccch!" Saw one of these commercials for Esurance the other night, and all I could think was, "Is this what happens to other advertisers in a category when one of them clearly does much better work?" (Think Geico.) Does it make them turn out this dreck in an attempt to get noticed? Awful. You'd expect some reshuffling to go on at TBWA/Chiat/Day upon the departure of Gerry Graf (at right, with minimal hair) from the agency, but an exodus? And so soon? That's what appears to be going on, with Scott Vitrone and Ian Reichenthal leaving for Young & Rubicam and Isaac Silverglate and Jeff Anderson going to Droga5. (I'm sure some of you would dispute that four people equals an exodus, but let's put it this way: it's still a bunch of bodies.) But all these shifts leave important questions unanswered. What I really want to know is how Hamish McLennan sells candidates on joining Y&R when his newly-appointed creative director, Tony Granger, is still forced to cool his heels at Saatchi & Saatchi working on creative projects until his contract is up where, of course, Graf is the new creative chief. Does Granger get to meet with his future employees? And what happens when Granger and Graf meet in the hallway? Someone please clear this up. I'm getting a headache. I'm not under the impression that Crispin, Porter + Bogusky's campaign for Coke Zero, charging the brand with taste infringement, has taken the world by storm. Anyway, looks like the agency has been pushing the brand on the Nascar circuit with this fairly humorous film, which is asking Nascar stars to throw a race so that Coke Zero--the official soft drink of Nascar--doesn't end up in the winner's circle. 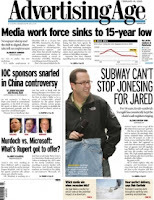 Wherein I scan the Monday and Tuesday morning headlines so you don't have to. —Marketing jobs, not media jobs, are where it's at. —How Rupert Murdoch could use Yahoo to rain on Steve Ballmer's parade. —What J. Lo's twins could fetch in the celebrity mag market. —The upfront presentations survive the writers' strike. —Starcom Mediavest Group dumps Donovan. —Absolut Irrelevance. Vodka brand ditches old campaign and watches sales go up. —Bob Garfield finds teensy-weensy problems in BBDO's new Monster.com spot. —AKQA is Adweek's digital agency of the year. —Barbarian's Benjamin Palmer on the possibilities of open-source creative. —Ground Zero buys a stake in a vodka brand. —Another interview with Microsoft's Yusuf Mehdi on why the company's proposed buying of Yahoo is a fantabulous idea. —Barbara Lippert talks about Jackie-Moon-meets-Bud-Light-meets-Old-Spice. And yes, all of it's right for you. —JC Penney plans to spend big to launch its American Living line. —Take a swig of this: socially-responsible water. —How brands fared in the Brand Keys Customer Loyalty Engagement Index Rankings. —Michael Bay's commercial for Verizon. —So what else is new? Scion campaign goes after youth market. —Mortgage companies slash their online spending according to Nielsen Online. You knew that was gonna happen. —The Advertising Research Foundation starts an official Engagement Council. —Denny's relationship with Publicis Mid America may be "on the rocks." —Is TBWA/Chiat/Day in trouble on Snickers? Hard to believe. That campaign is great. —Merger of Miller Brewing and Molson Coors to lead to $700 million review? —More on that JC Penney campaign, including the actual ads, which were shot by Bruce Weber. —Despite what Nielsen Online says, mortage advertisers are still very active. —Don Scales' plan to get back at Omnicom. —Martha Stewart Living to buy the Emeril Lagasse empire. OK. That's it. Have a good one.